Eloy Perez Fighting For A Good Cause! Newly crowned NABO Super Featherweight 'Fighter Of The Year” and undefeated NABO champ Eloy 'The Prince' Perez, is dedicating his Friday, Oct 28th clash against Ira Terry live on TeleFutura's "Sólo Boxeo Tecate" to all the women and their families who have had to battle breast cancer, and to honor the women who succumbed to this disease, in particular, Eloy's boss Oscar De La Hoya"s mother Cecilia. Eloy's suit will bear the names of two women who have survived and who are very important to Team Perez, Olaya Hernandez, his trainer Max Garcia's sister, and Malena Garcia, a family friend. Sy Sherman, a young man of 9 years of age will be joining Eloy in the ring. On February 21, Sy was diagnosed with hepatocellular carcinoma (HCC), a type of liver cancer. Team Perez is requesting everyone who attends the boxing event to help Sy and his family fight this horrible disease and requests a donation be made to them at the event. A special box will be on hand to collect those donations. 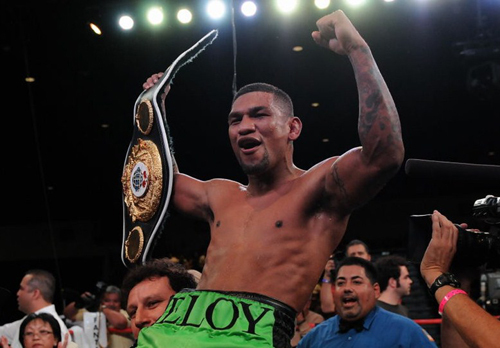 Pound4Pound spoke to Eloy recently and we got to ask him some questions about his upcoming fight and his career. Pound4Pound: You are fighting in your adopted hometown of Salinas, California, how long have you lived there? Eloy Perez: I have been down here from Washington for 5 years now, you can call Salinas my second home! P4P: You have a big fight ahead of you on a Telefutura card on Friday night. You are facing a good veteran in Ira Terry in the main event. Tell us about that fight and your preparation. EP: I know Ira Terry is a good fighter. I only had three weeks notice but I will be ready, I know he is tough, but you gotta be ready! This is my job, I am a fighter, so if they give me the call I have to be ready to take it. P4P: It’s kind of a Catch 22, it’s hard to take a fight on short notice but at the same time I know you do not want to pass up this chance. EP: Right! I don’t want to be labeled as a guy who when he gets the call isn’t able to go. I am going to look good and win and then I am going to continue my career. P4P: How did you become interested in boxing and when did you get your start. EP: It started when I was young, I was little and chubby and I had poor self esteem. I started getting in trouble. So my Dad said if you like to fight then we are going to the gym! So I went to the gym and lost the weight, my life really changed thanks to boxing. P4P: How long did it take for you to make the transition from troubled youth to focused fighter? EP: Just one summer! I went to the gym all summer and lost the weight and when I went back to school I was popular and the girls started to notice me. It was a great change. P4P: At what point in your career did you start to believe you had a real shot at a title? EP: It was the fight right before I fought Dannie William for the USNBC title, which was against Gabe Garcia. I felt really good in that fight and felt I could become a Champion. EP: I want to win a World title at 130 and I want to make a name for myself. I want to be remembered as a Champion, not just someone who is trying to make money. When it comes down to it I want to get in the ring and put a good show on that the fans will enjoy. P4P: So with a victory this weekend will you be asking for a world title shot? EP: That’s what I want, my shot at one of the champs at 130 pounds, that’s what it’s all about for me now.